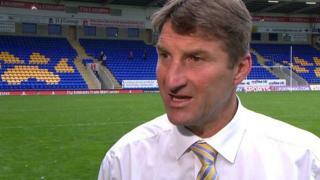 Warrington coach Tony Smith said they never thought the game was lost as they came from 18 points down to win 22-19 at home to Widnes in the play-offs. Joel Monaghan scored a hat-trick of tries to help Wolves fight back and ensure last year's Grand Final runners-up progress to a preliminary semi-final eliminator against Castleford on Thursday. Widnes coach Denis Betts added that his players are hurting after a defeat which they felt they should have won.